Edmunds.com, one of the web's leading resources for car-buying research and long-term Buick Regal Grand National tests, filed a lawsuit against a Texas company it says registered more than 2,200 fake online profiles that submitted reviews of car dealerships. Edmunds isn't happy about it, and now they're going to court. The lawsuit accuses Friendswood, Texas-based Humankind Design, who bill themselves as an "online reputation company," of violating their terms of service, trademark infringement, fraud, false advertising and other acts. 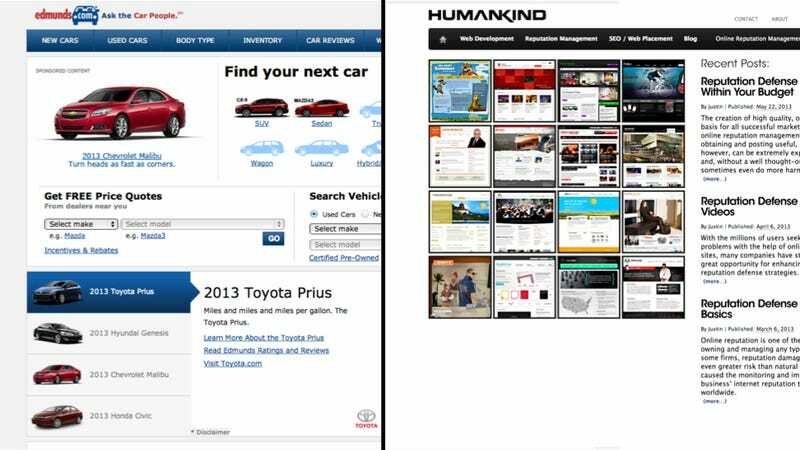 Edmunds' lawsuit claims that Humankind registered scores of fake member accounts on their site that were used to create content designed to sway users' opinions of car dealers. Apparently, this is Humankind's whole business model. The lawsuit alleges that Humankind operates websites like glowingreviews.co, which, according to TIME, charge $25 and up a month to post reviews at what it calls “supported sites" such as Yelp, Google Plus, FourSquare, CitySearch, Cars.com, and now Edmunds.com. They say that they use the logos of these companies without their consent, hence the trademark violation. In general, the review sites state that you must be posting for yourself and not for someone else. So in these cases the answer would be yes. That said, if you take the time to actually read the TOS you'll see that it's very easy to break something. But this really begs looking back at the big picture. Take SEO as an example. Every link that you build to your site, every fiverr gig that you buy, every article you publish on EZine Articles is violating Google TOS. In fact, anything you do to help improve your site's ranking violates Google terms. Every business plays in this grey area and this service just lets you do it much more efficiently. Exact damages sought by Edmunds are not specified in the lawsuit. The TIME story goes much deeper into Humankind and their website. Contacted by the news site, a spokesman for Yelp said he was unaware of these specific comments on their site, but said they're hardly the only company doing this, and that they're currently working to crack down on fake reviews. I can't wait to see how this one plays out in court. It could have a lasting impact on these attempts to feed fake reviews onto websites. Have you ever seen fake-looking review comments at Edmunds?